Pavilion with Pointed Roof pattern (see below). Both central images are surrounded with a variety of floral sprays. Two variations of the butterfly border were used on the inner and outer rim. The opposite side of cup. 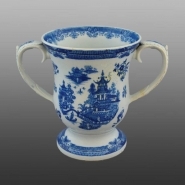 A large vase shaped pearlware loving cup with molded acanthus leaf handles. On one side is the hand painted name and date, "R. Ashlin, 1798". Printed in blue on the other side is the Pavilion with Pointed Roof pattern (see below). Both central images are surrounded with a variety of floral sprays. Two variations of the butterfly border were used on the inner and outer rim.